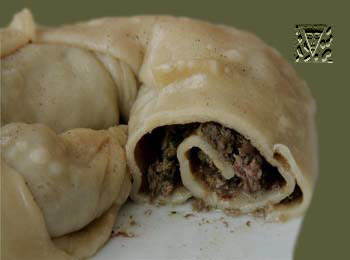 Tatar katlama is a beef roll, prepared on a pair, variety of dumpling. For preparation of beef roll, meat and unleavened dough which is involved on the added some salt, milk with eggs and oil, will be required you. To roll dough the same as for a noodle. To prepare the beef stuffing or finely cut a beef, adding onions, salt and pepper. To lay the prepared filling on dough a layer in a 1-1,5 cm, and to displace a meat loaf. To stick up the edges of meat loaf by dough, that meat juice did not flow out. To put the prepared meat loaf in a steamer or mantowarka and cook on a pair to readiness. Then to put a meat loaf in a oiling frying pan, smear a top oil, to hold for some time in an oven, cut pieces in three centimetres thick and to give on a table. Ingredients: dough - 100-150, beef (pulps) - 75-100, bulb onion - 25-30, salt, pepper - to the taste.